Sometimes I begin planning a garment first and then embark on a quest for finding the right material for it, sometimes I find a material I like and only then begin to think what it could become. This project belongs to the latter category. A few years ago I was shopping in Helsinki the day after the Christmas ball. 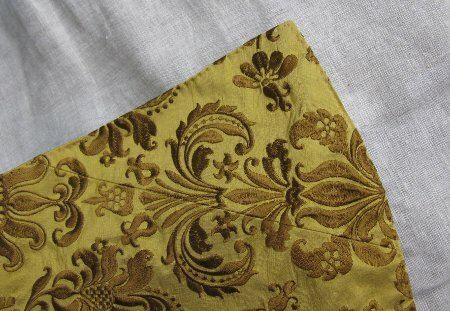 My brain being happily on the 18th century mood I instantly fell in love with this embroidered dupioni silk, which was even surprisingly affordable. When Jarno came to pick me up I showed my find to him and he liked it so much that he suddenly realized that he will need another waistcoat sooner or later. 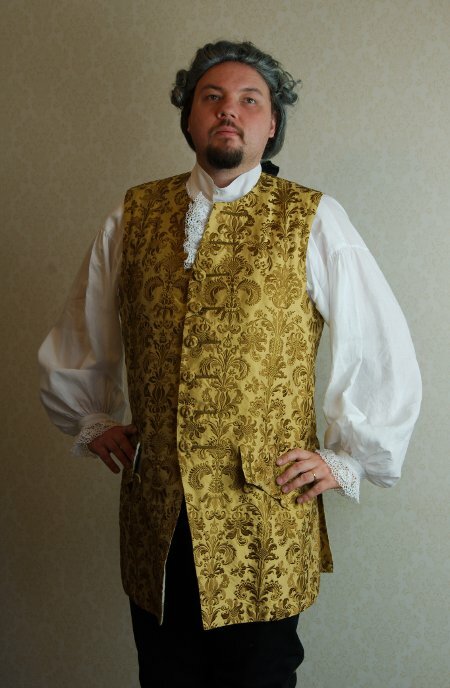 The idea of another, more elaborate waistcoat was actually a very good one, especially as time passed and his first one began to show signs of wear. It took me two years, however, to begin it. At last I decided I needed to make something new for the year 2011's Christmas ball, and for change it would be Jarno getting the new stuff. I used the pattern I had made for Jarno's first waistcoat, only changing the shape of the front edge a bit, making it curve lower and adding one buttonhole. This time I also made a period-correct back lacing. Inspired by the beautiful material I also decided to use a more handsewing-based construction technique instead of the simple bag-lining of the first waistcoat. Happily I had bought a bit more material than I thought I needed, as the combination of a large embroidery pattern and large front pieces weren't exactly fabric-economical. In the end I had to make a bit of piecing on one corner, but that's just period, right? I managed to match the pattern quite well but it took a few attempts. 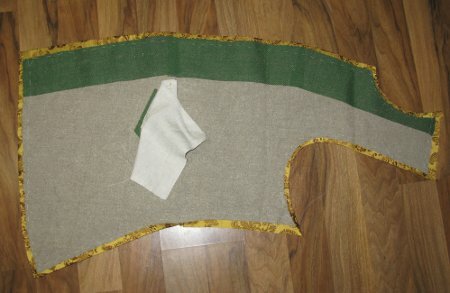 I interlined the whole front pieces with heavy linen as the thin silk needed backing. I also reinforced the edges of the pocket openings. 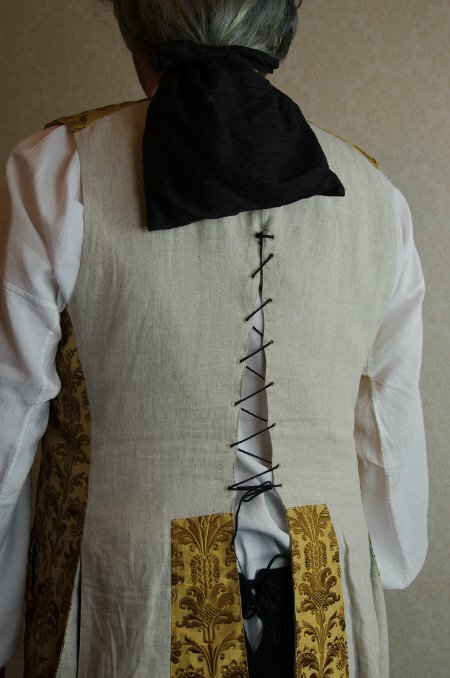 Following the method I had first tried with Jarno's 15th century doublet I then ironed the seam allowances of the silk to turn over the edges of the interlining and sewed them on the interlining by hand. Then I made the triangular pocket openings and sewed on the pocket flaps. I cut the back pieces doubled of a finer linen and added pieces of silk on the edges of the back slit and neck. I bag lined them and stitched the edges and the seams of the silk coverings by hand. I had reinforced the edges where the lacing would go with linen tape, and now I worked the lacing eyelets. Medievalist folks had introduced me to this wonderful thing called luceting, which is just as perfect for 18th century lacings as well. With the back thus finished I closed the side seams, turning the seam allowances on the front piece and sewing then down like at the edges. 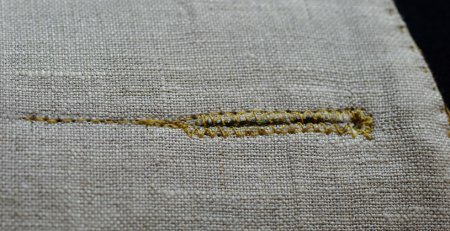 Then I pinned the lining, which was of the same finer linen as the back, on its place, turned the seam allowances under and stitched through all layers. 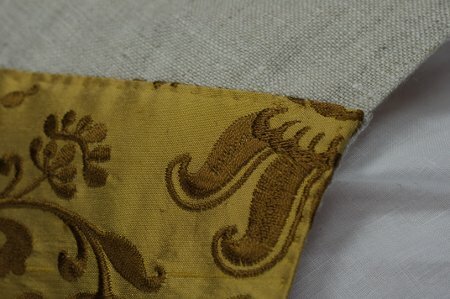 Next I marked the places for the buttonholes, machine sewed around them, cut them open and bound the edges with zig zag. For finishing them I used embroidery floss, which I chose because I needed a color that would match the embroidery. Embroidery floss was very nice to work with, though I don't know how it will take wear - time will tell. I made basic fabric covered buttons, backing the silk with iron-on interlining (not being were period there, I confess) and adding a piece of flannel between the silk cover and the button. The heavy embroidery made the buttons a bit clumsy, but I decided to think they won't show that much anyway. For the last thing I closed the shoulder seams, which I had left open until now so that working with the buttonholes would be easier. Like with the side seams I pressed the seam allowances on the front and sewed on the lining last. This made the neck and armhole a bit bulky at the seam, so on the afterthought I should have rather turned them inside the back pieces instead. I was not, however, going to change that at this point, especially as the Christmas bal was due in a few days. I really enjoyed making this waistcoat. 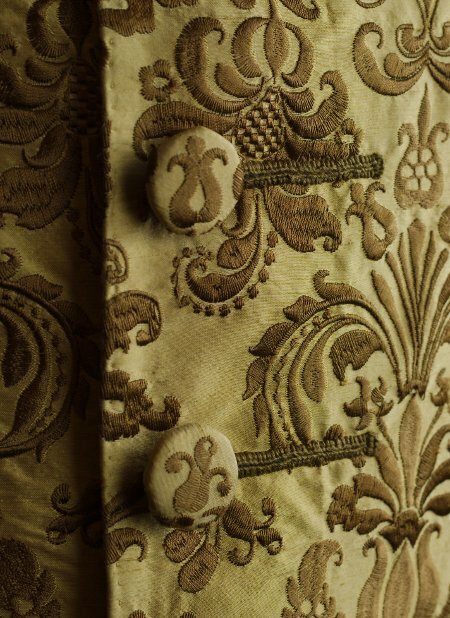 Being able to work with an already tried pattern and concentrating on careful construction without being in a terrible hurry was very rewarding after the mad rush of some late projects and the harrowing self-doubt of Jarno's 18th century coat. The best thing, however, was the material. 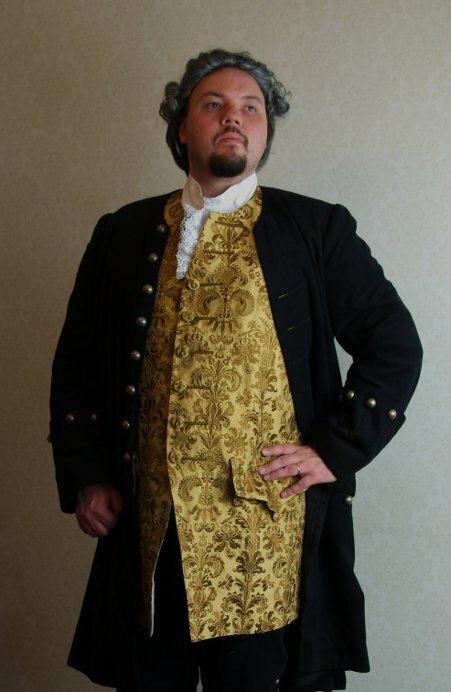 Although all over-embroidered pattern on a waistcoat, let alone on dupioni is not quite period accurate, the waistcoat still gives me an 18th century feel that some of my other, though pretty but somewhat more movie-esque creations fail to portray. I also like the neat and stiff construction with all that hand sewing, and Jarno even claims it feels different from modern garments.